Artwork Panel: 28.5cm x 56.1cm ≈ 11¼" x 22"
Silk/Brocade: 38cm x 120cm ≈ 15" x 47¼"
Width at Wooden Knobs: 47cm ≈ 18½"
Discounted: This print had a misaligned printhead. It is a subtle problem where the registration is slightly off, and it appears very slightly blurry. I am very picky, so this is going cheap. I hear that college film students like to use stuff like this as props for student movies. For only $15 why not? 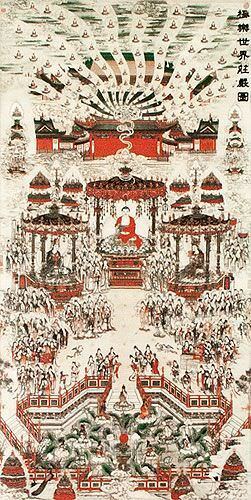 This print features a scene of the Buddha with a multitude of followers and his many reincarnations streaming across the sky. This is giclee printed on handmade Chinese xuan paper with a high-fiber content (you will see lots of natural husks and fibers pressed into this paper). The artwork was then mounted to a handmade two-tone silk brocade wall scroll.